The International Sustainable Livelihood Foundation (ISLF) is a non-political, non-profit, and 501 (c) (3) (tax exempt) Foundation incorporated in the State of Delaware, USA. The goal of the Foundation is to “promote sustainable livelihood and economic empowerment of people affected civil strife and natural disaster”. The foundation’s immediate objective is “to support and enhance the livelihood of the war affected people of the Northern and Eastern region of Sri Lanka. 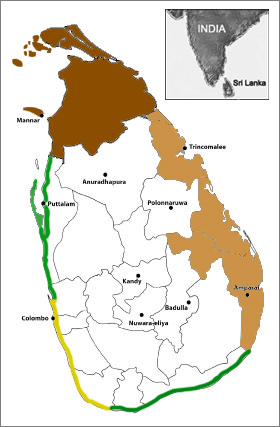 It is about four years since the long-drawn civil war in Sri Lanka has come to an end. Yet, for many people in the Northern and Eastern provinces of the country, the struggle for survival and livelihood continues. There is an urgent need to restore livelihood, restart economic development and transition the war-torn areas from a situation of conflict to a ‘normal’ environment. In the conflict affected areas, unemployment is very high; and farming and small business activities have been severely impacted. A vast majority of the affected population is still dependent heavily on handouts for their day-to-day survival. These are people, who were, before the war, prosperous and contributing significantly the economic growth of the region and the country. These are proud people who deserve more than handouts and charity. Given an economic stimulus they are capable of regaining their previous economic status. ISLF’s aim is to help create this stimulus.